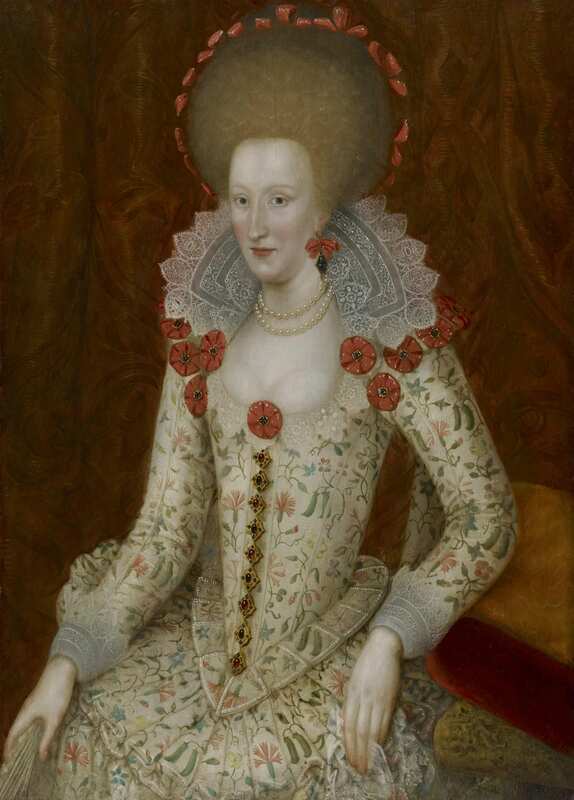 Previously and erroneously described as depicting Lady Arabella Stuart, our painting can be confidently identified as an unrecorded portrait of Anne of Denmark (1574-1619), Queen consort to James VI of Scotland and I of England. Her father was King Frederick II of Denmark and Norway, and her brother was Christian IV of Denmark. In 1589, aged just fifteen she was married by proxy to James VI of Scotland, at Kronborg Castle in Oslo and was crowned Queen the following year in the abbey church at Holyrood, Scotland. By 1603, when James I ascended to the English throne, there were three surviving children from their marriage – Prince Henry Frederick, Prince Charles and Princess Elizabeth. Possibly ‘From the Saleroom’ from The Connoisseur, Vol. 102, 1938, p. 341. ‘Forthcoming Sales’ from The Burlington Magazine for Connoisseurs, Vo. 73, no. 427 (Oct., 1938), p. xxii. The National Maritime Museum’s portrait is perhaps the finest of all the portraits of Anne to be painted in oils during the first half of her reign. Possibly painted ad vivum, it supersedes in quality all her other portraits hitherto attributed to John de Critz, as set out in the iconography of the Queen in 1969 by Sir Roy Strong, and in 1981 by Lucy Wood. Images of Anne of Denmark before 1603 are rare and attribution often obscure, however subsequent to 1603, following James’s assent to the English throne and the establishment of their courts in London, Anne was able to commission portraits from de Critz. This important early portrait, coupled with the discovery of our painting and affirmed by an identical version at Blickling Hall, Norfolk (National Trust), adds to the recorded oeuvre of de Critz’s work and helps to elucidate our knowledge of early Jacobean court portraiture. It is possible to date these earlier two portraits to c.1605, since by 1609 the Queen had changed her hairstyle from the high piled-up hair to the more bouffant style seen in our portrait. John de Critz was born in Antwerp and brought by his parents to England as an infant during the Habsburg persecution of Dutch Protestants. By 1567 he was apprenticed to the Flemish Mannerist painter Lucas de Heere, who was then residing in England. It was probably de Heere who introduced de Critz to the statesman Sir Francis Walsingham, for whom he worked in Paris and perhaps in Italy. He was well aware of European Mannerism and of the School of Fontainebleau. In 1605, de Critz was granted the office of Sergeant Painter to James I for life, a post he was to share jointly with the obscure figure of Leonard Fryer, and then with Robert Peake from 1607 onwards. No signed works by de Critz are known, however certain paintings are documented; in 1606 he was paid for a full-length of the King, with two others of Anne and of ‘the Prince’ to be sent to the Archduke of Austria. Thus, he is generally accepted as the painter of the first of the portrait types in oil of the new King and Queen, and the de Critz face pattern provided the prototype for further studio reproductions and other versions. Our portrait of Anne of Demark is of a type which can be associated with the Serjeant Painter John de Critz. Portraits of Anne of this type were conceived to hang as pendants to ones of her husband James I. Anne is shown with her hair piled high, a style she kept until about 1609. See: Roy Strong. The English Icon: Elizabethan & Jacobean Portraiture. London, 1969, p. 264, ill. 249. D. Scarisbrick, Jewellery in Britain 1066 – 1837: A Documentary, Social, Literary and Artistic Survey, Norwich, 1994, p.118. R. Strong, Tudor and Jacobean Portraits, London, 1969, vol.I, pp.7-10. L. Wood, The Portraits of Anne of Denmark, MA thesis, 1981, Courtauld Institute. Among the first portraits to be painted of Anne as Queen, the three finest are the pendant to the full-length of James at Loseley Park, the three-quarter- length formerly at Tyninghame, and the three-quarter-length at the National Maritime Museum, Greenwich (formerly with The Weiss Gallery). See Mrs Rachael Lane Poole, ‘An Outline of the History of the de Critz Family of Painters’, Walpole Society, cited in K. Hearn, Dynasties: Painting in Tudor and Jacobean England 1530-1630, no.125. Some of De Critz’s work at court can be traced through his bills, which involved the restoration of decorative details, the painting and gilding of royal coaches and barges, and individual tasks such as painting the signs and letters on a royal sun-dial. See: W. Gaunt, Court Painting in England from Tudor to Victorian Times, London, 1980, p.53. He was also known to paint the scenery for court masques and dramatic spectaculars.